Sony Global - Sony Commercializes World's First Demodulator LSI for "DVB-T2"
Tokyo, Japan - Sony Corporation today announced the commercialization of the world's first demodulator LSI for high-definition television use conforming to the "DVB-T2"*2 (Digital Video Broadcasting - Terrestrial 2) terrestrial digital broadcast standard adopted in the UK. "DVB-T2" is a new terrestrial digital broadcast standard which improves on the current "DVB-T"*3 terrestrial digital broadcast standard adopted in Europe and various other countries and regions around the world. "DVB-T2" significantly increases data transmission capacity compared to "DVB-T", and optimizes use of band frequencies to enhance the quality of high definition broadcasts. The first "DVB-T2" standard terrestrial digital broadcasts commenced in the UK in December, 2009. 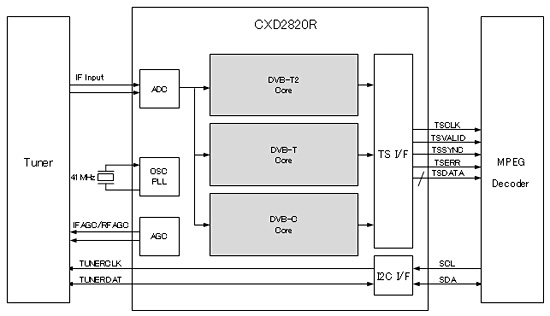 This "DVB-T2" specification demodulator LSI incorporates Sony's proprietary reception algorithms and error correction circuits to achieve highly sensitive reception, even within weak electric fields, and stable reception within multipath environments, while also reducing power consumption. It is also compatible with the current "DVB-T" standard, as well as the "DVB-C"*4 cable broadcast standard, providing flexibility for "DVB-T2" set designs, while contributing to miniaturization and a reduction in the number of components. With adoption of the "DVB-T2" expected to expand to various countries across Europe and around the world, Sony will actively promote the use of this new LSI to manufacturers of large-screen TVs, set top boxes and other applicable products. This LSI is to be used in UK models of Sony's "BRAVIA" LCD TVs which are scheduled to be released in 2010. World's first*1 demodulator LSI for "DVB-T2", compatible with three standards ("DVB-T2", "DVB-T" and "DVB-C") contributing to product miniaturization and reduction of components. 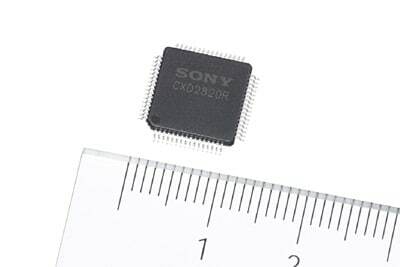 Sony's proprietary reception algorithms and error correction circuits ensure high sensitivity reception, even within weak electric fields (CNR of 19.2 dB required for DTG109 transmit parameter broadcasts in the UK) and stable reception within multipath environments. Low power consumption of 700mW (typical consumption when LDPC decoder operating at maximum level). *2 DVB-T2: Second generation terrestrial digital broadcast standard "ETSI EN302 755". This is the improved version of the first generation "DVB-T". Digital sound and video signals are transmitted using orthogonal frequency-division multiplexing (OFDM) digital modulation. Using a time interleaver and LDPC code (a kind of error correction system) improves the transmission efficiency by approximately 50% compared with "DVB-T". *3 DVB-T: First generation terrestrial digital broadcast standard "ETSI EN300 744". This standard is adopted in various countries and regions around the world including Europe. Digital sound and video signals are transmitted using orthogonal frequency-division multiplexing (OFDM) digital modulation. *4 DVB-C: Cable digital broadcast standard "ETSI EN300 429". This standard is adopted in various countries and regions around the world including Europe. Digital sound and video signals are transmitted using quadrature amplitude modulation (QAM) digital modulation. *5 Multiple-PLP: Technology which multiplexes plural transport streams adopted in "DVB-T2" in a physical layer. This LSI conforms to DTG400, DTG401, DTG402, DTG403, DTG404 and other parameters.